The seller had it advertised locally (Amarillo), so I called him up, talked to him, made an offer, and bought it. It has a Pro Circuit pipe and silencer, PR2 suspension, Delta V-Force III reeds, N-style gripper seat, Chevy Trucks/Pro Circuit graphics, and Pro Taper bars. Just what I wanted! It's a great bike. Light, fast, very good handling, and it's small and compact and really fits me well. The original owner raced Arenacross on it in the Amarillo area, then sold it to the 2nd owner who ended up breaking his collarbone within 2 months. Although it's an '01, it was purchased new, in the crate, in '03 from a dealer going out of business. Here we can see the Pro Circuit pipe (w/ a few small dents), the frame guards, and the 03 side panels. Bike has a Pro Circuit shorty silencer that's a little barky, but it's still nowhere near as loud as a 4-stroke. As you can see, I get my dirt bikes dirty from time to time. And here's the cockpit! Pro Taper bars. It's a real slim, comfortable bike, easy to move around. Turns great- I can pretty much change lines at will and it's a very confidence-inspiring bike. Here I am practicing turns on my front yard "track". Our dirt is hard as a rock and it's hard to get even these little berms built up. I finally had to get my backhoe out and rip up the topsoil. This little piece up close to the corrals is a little sandy and that helps. Another berm shot. I might be raising more dust from my foot than from the bike....LOL. 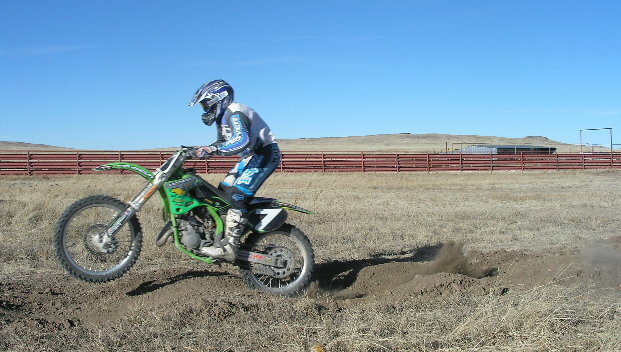 The KX125 is a lot of fun, as you can see here. One of these days, I need to truck some dirt in and make some jumps and- especially- some whoops. However, this is also the staging area for cattle trucks when we ship cattle, so it wouldn't be good to build a full-tilt MX track right here. Here's a shot from my "dirt pile" track about 3 miles from the house. This is kind of "tabletop" sort of jump, I guess- up one side of the dirt pile over the top, and land on the ramp. It's about 30' over the top- not a whole lot. Above- I'm coming down for a landing. I've come a long ways from flying my XR75 when front wheel landings were sure-death!!! I'm playing in my little "whoop section". After looking at these photos, I can see I've got a little work to do...I need to bend at the waist a bit more and get my head down and my elbows up a little more. I also noticed how much my rear suspension is compressing- after I saw these shots, I installed the stock shock spring (stiffer than this one). I'm in 3rd gear in these pictures, FWIW.